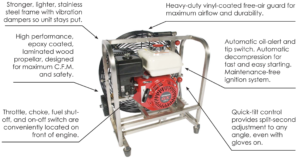 The #1 choice by firefighters for Positive Pressure Ventilation fans for extreme duty service. 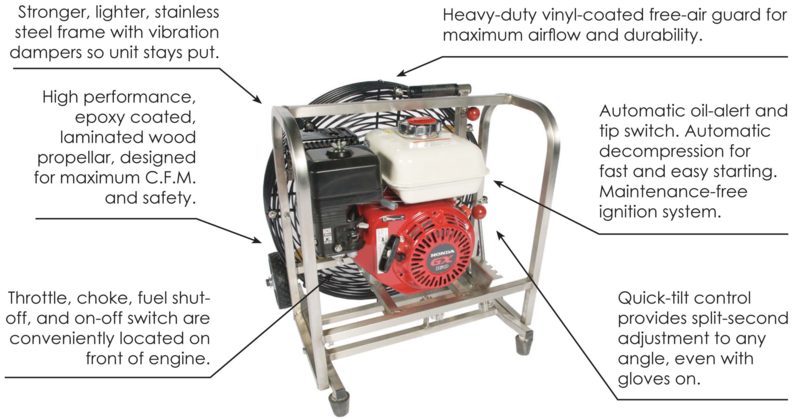 Our fans are stronger, lighter, stainless steel frame with vibration dampers so the unit stays put. The high performance laminated wood propeller made of aircraft grade laminated maple is designed for maximum C.F.M. and safety. Heavy duty vinyl coated fan guard is designed for maximum airflow and durability. The unit features a tilt control and an extendable handle and wheels for greater mobility. Powered by Honda engine The throttle, choke and on- off switch are conveniently located on the front of the unit, our units have automatic oil-alert and tip switch. It also has automatic decompression for fast and easy starting. Wheels are standard unless customer specifies no wheels. Specifications are subject to change without notice.